When Ibrahim Massaquoi was admitted to the Children’s Ward of Bo Government Hospital in Sierra Leone, he had a high fever and was suffering from acute malaria. Here his mother, Sallaymatu Massaquoi, tries to use a towel to lower his temperature. Ibrahim Massaquoi's dramatic arrival into the children’s ward hijacks everyone's attention in the late afternoon of May 17. His parents and other weeping family members crash into the children’s ward at the Bo Government Hospital with the 4-year-old, who is struggling between life and death. He is placed on a hospital couch, where he is convulsing violently. His mother, Sallaymatu Massaquoi, is not in tears like the other family members. She looks more composed than even the father. She explains that this is Ibrahim’s third serious bout with malaria, and it is comparatively less life threatening than previous occasions. “The last time, he convulsed more violently and was in a coma for three days,” Massaquoi says. With another 2-year-old baby strapped to her back, she leaves the hospital to look for food for the younger child, while nurses tend to Ibrahim. Ibrahim is in a high-risk group. Most fatalities from malaria, a mosquito-borne disease, occur in children under 5. Sierra Leone’s government, along with partners such as The United Methodist Church, is planning a major outreach campaign in June to protect families from malaria and boost the health of small children. Ibrahim arrived at the hospital with “queried malaria,” nurse-in-charge Elizabeth Fortune explains later, after the boy’s condition is stable. Queried malaria is a condition in which a patient shows all the symptoms of acute malaria. “Usually when a child is brought in this kind of condition, we go ahead to treat the patient so as to avoid losing their lives. A proper test and diagnosis are later done after we have controlled the temperature and convulsion,” Fortune says. 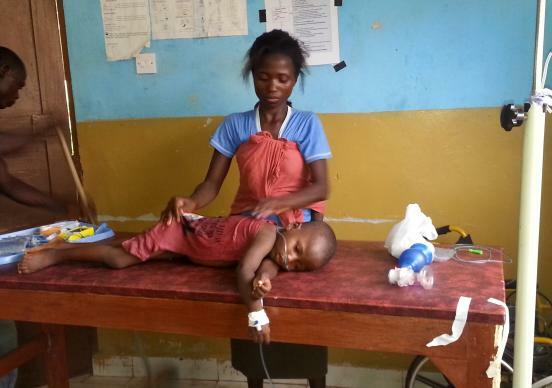 In Ibrahim’s case, test results were being processed as the nurses battled to control the fever and convulsions. Sierra Leone’s Ministry of Health, together with other partners, promotes the use of long-lasting insecticide-treated nets as a means of reducing infection rates. The Massaquoi family’s net, however, wore out more than a year ago, and the family has been unable to afford a new one. Sallaymatu Massaquoi is an unemployed hairdresser, while her husband, Mattia Massaquoi, is a “battleman” (a term used in Sierra Leone to describe hustler-drivers without vehicles. They usually hang out in car parks to assist employed drivers in order to eke out a living). The family obtained their last net in 2010, and the nets are usually effective for three to five years. Sallaymatu and her two kids sleep on the same bed at night, and the family has endured repeated malaria attacks. She later tells United Methodist News Service that Ibrahim actually developed fever two days before going to the hospital. He was taken to someone in the neighborhood for treatment and received an injection. The pain subsided but re-emerged the following day about 10 a.m. The family showed up at the hospital at 3:30 p.m. The United Methodist Church, through its Imagine No Malaria initiative, is partnering with the Sierra Leone government for the second time in June to supply long-lasting insecticide-treated nets nationwide. The first successful nets distribution was in November 2010 as part of an effort that included polio vaccination, Albendazole tablets (for treating infections caused by tapeworms) and vitamin supplements for children under 5. The 2010 Maternal and Child Health Week Campaign, the largest ever undertaken in Sierra Leone, included distribution of more than 3.2 million nets to all households in the country. Imagine No Malaria provided more than 600,000 of the nets, with 340,000 sent to the Bo District, where United Methodists provided supervision, funding and logistical support. Imagine No Malaria is supplying an even larger quantity — 390,000 nets — in the June campaign to the Bo District. The national campaign will distribute 3.5 million nets nationwide. The June 5-14 campaign will also provide Albendazole tablets and vitamin supplements for children under 5, according to Dr. Samuel Smith, manager of the National Malaria Control Program. The outreach will be followed by a national nets hang-up campaign June 25-29, he said.